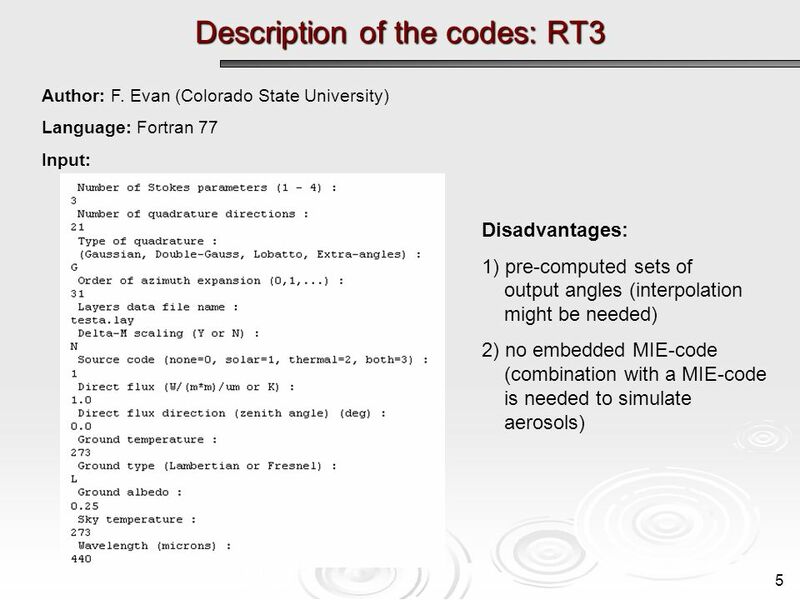 Radiative Transfer Codes for Atmospheric Correction and Aerosol Retrievals: Intercomparison Study AEROCENTER Fall Seminar Series, October 2 nd, 2007 Svetlana. 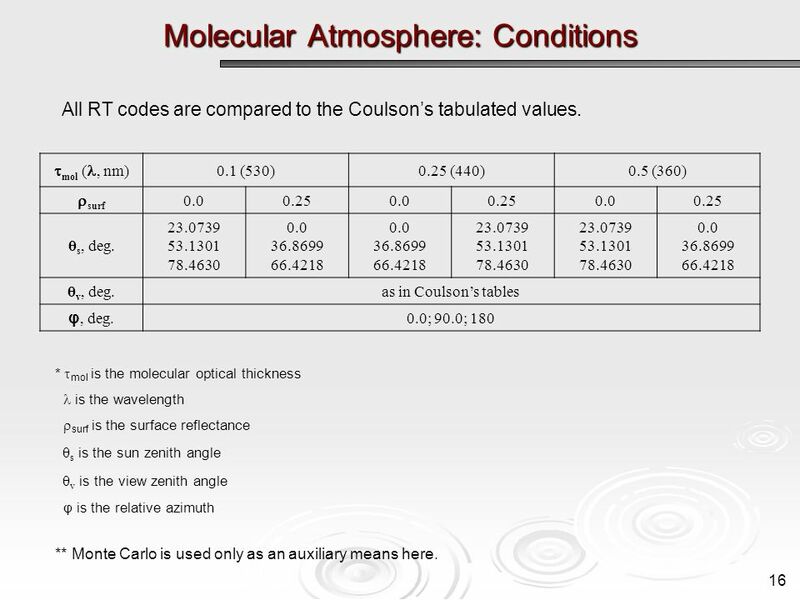 13 Benchmarks: Coulsons tables 13 Coulsons tabulated values represent the complete solution of the Rayleigh problem for a molecular atmosphere. 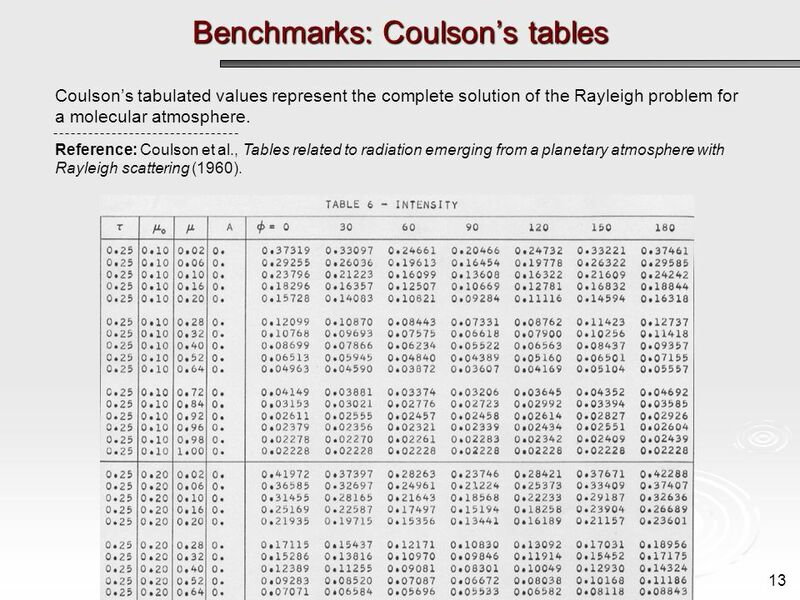 Reference: Coulson et al., Tables related to radiation emerging from a planetary atmosphere with Rayleigh scattering (1960). 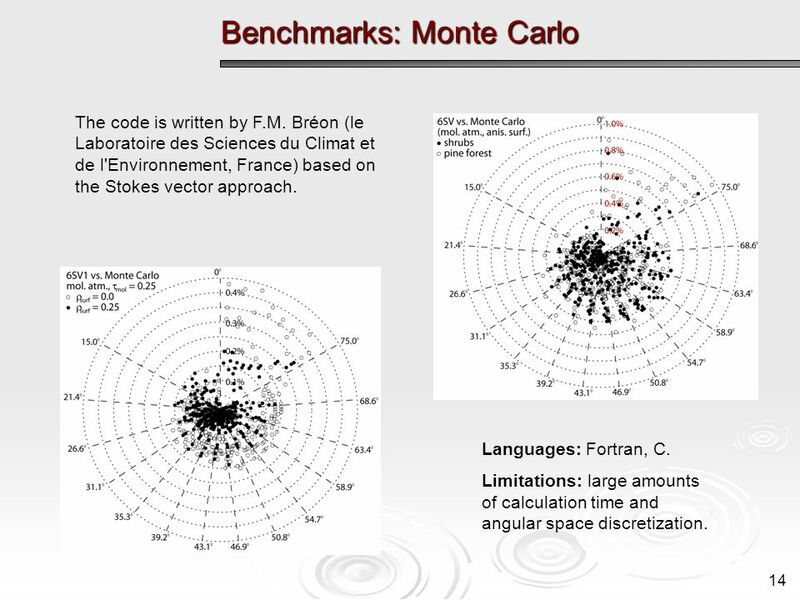 14 Benchmarks: Monte Carlo 14 The code is written by F.M. 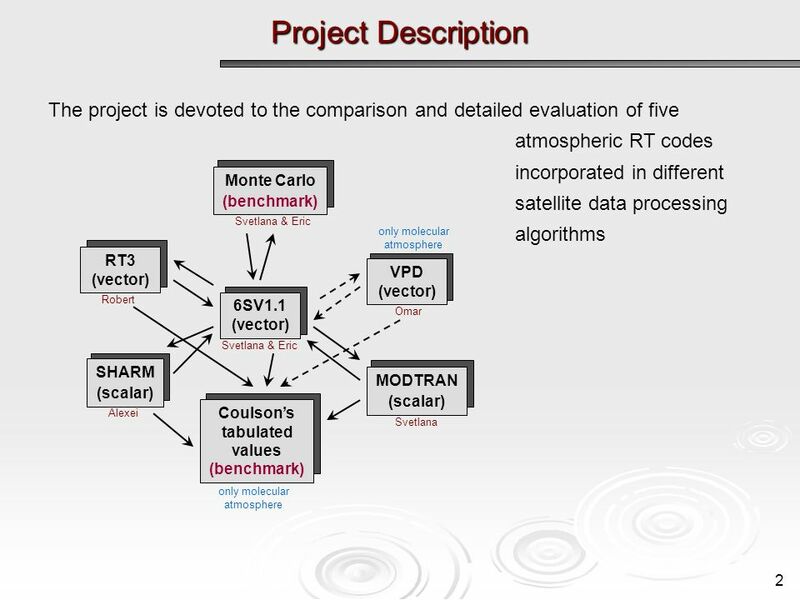 Bréon (le Laboratoire des Sciences du Climat et de l'Environnement, France) based on the Stokes vector approach. 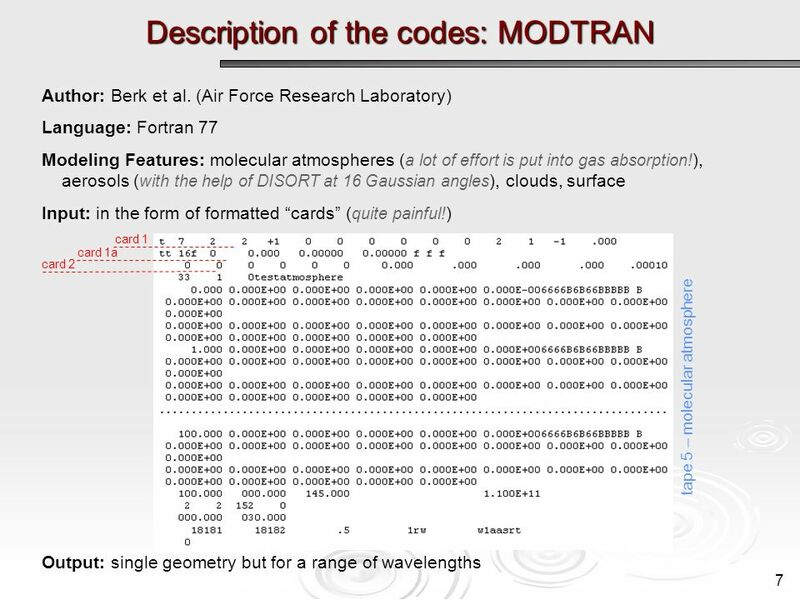 Languages: Fortran, C. Limitations: large amounts of calculation time and angular space discretization. 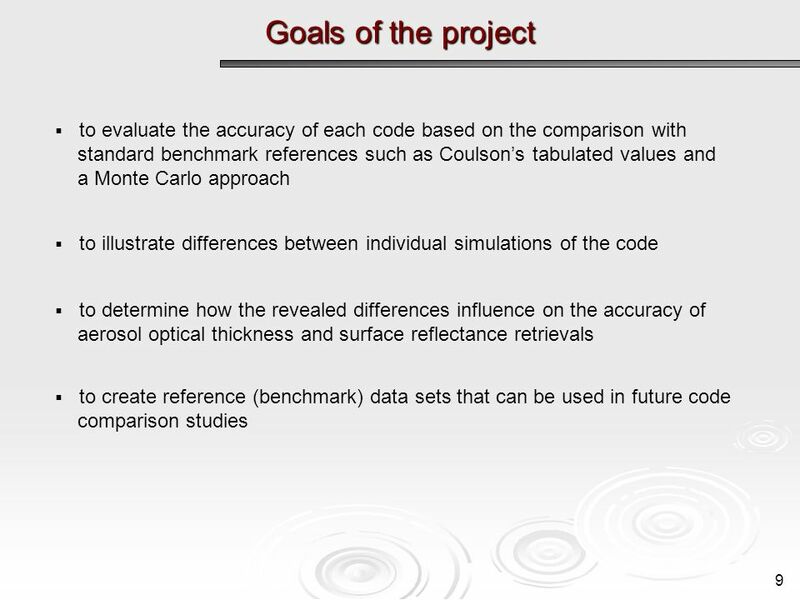 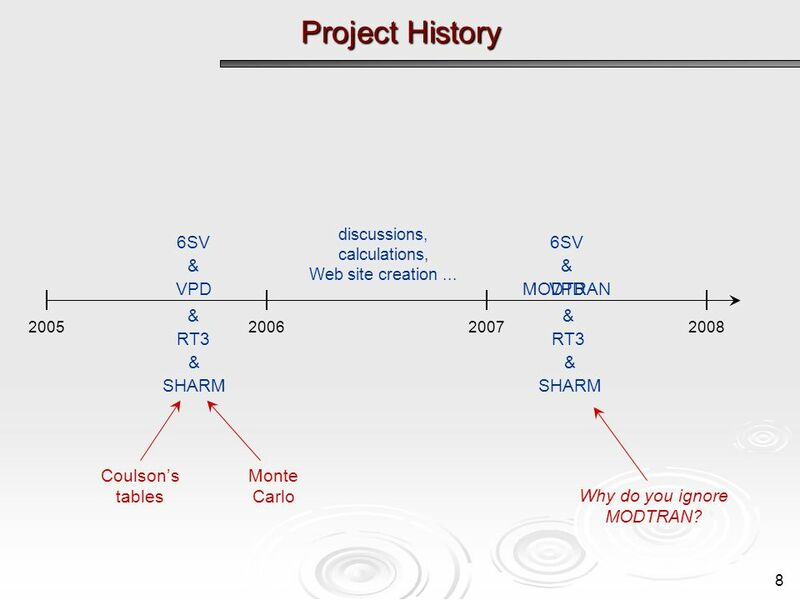 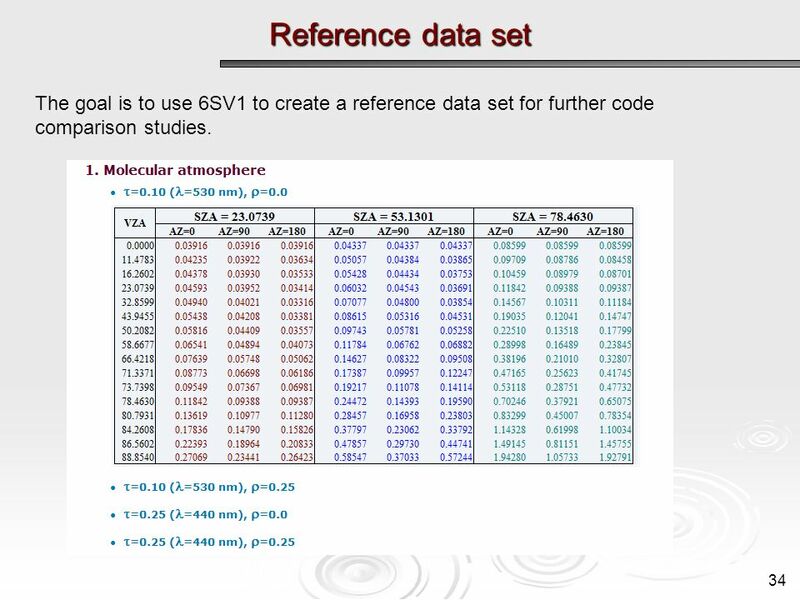 34 Reference data set 34 The goal is to use 6SV1 to create a reference data set for further code comparison studies. 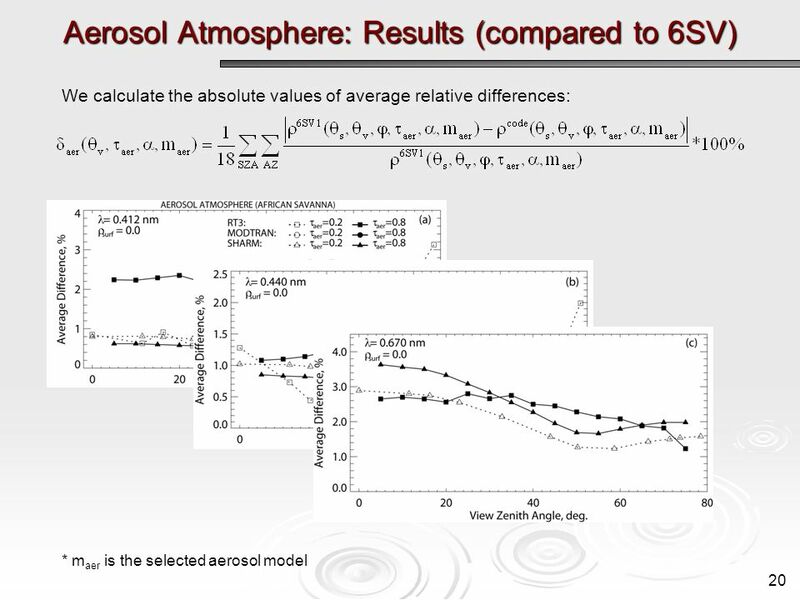 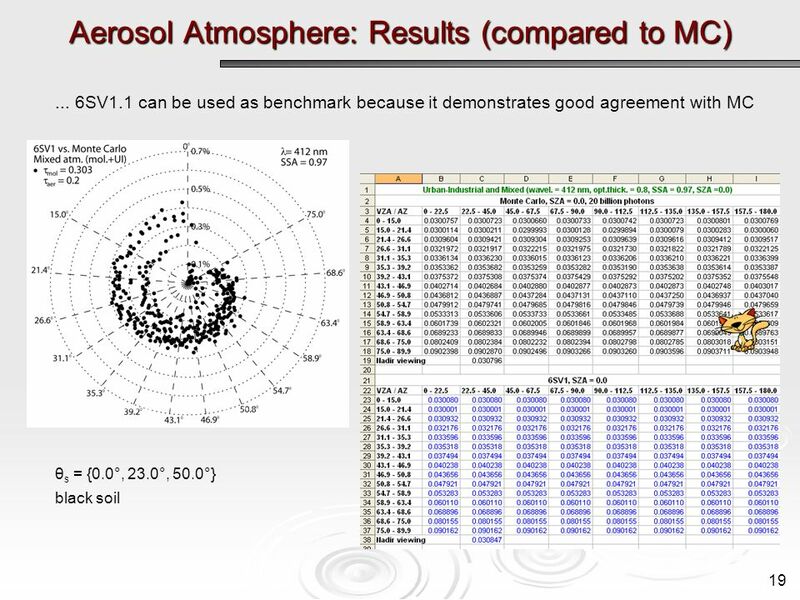 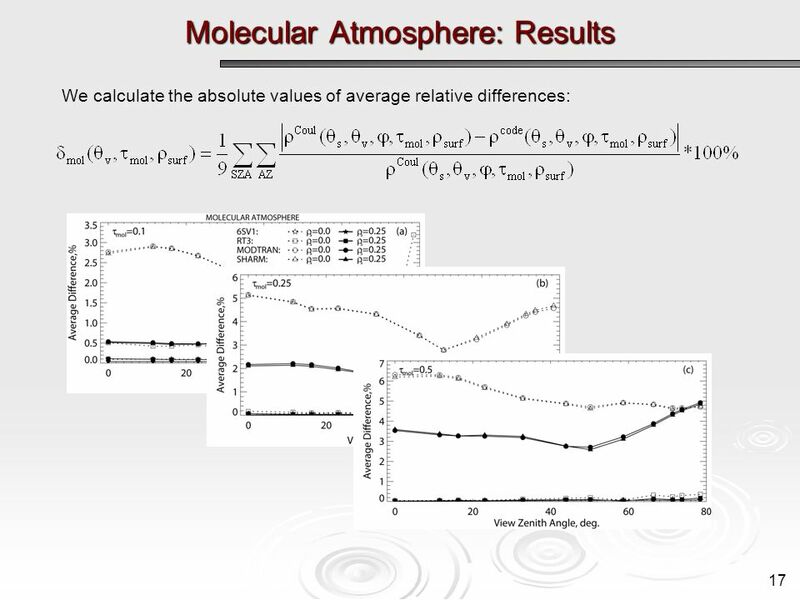 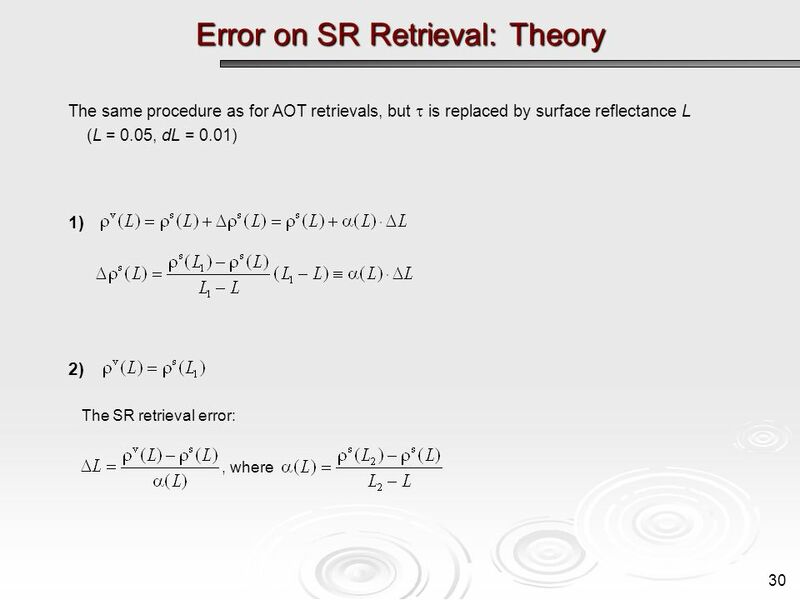 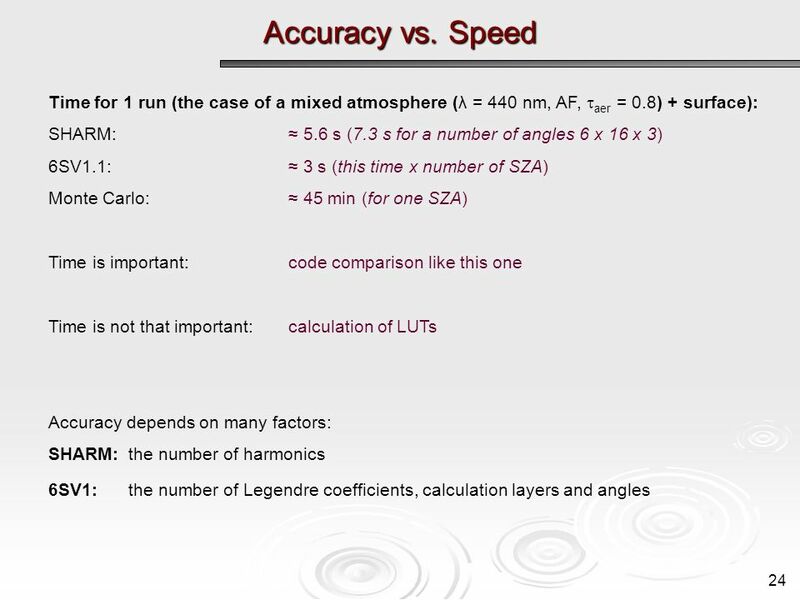 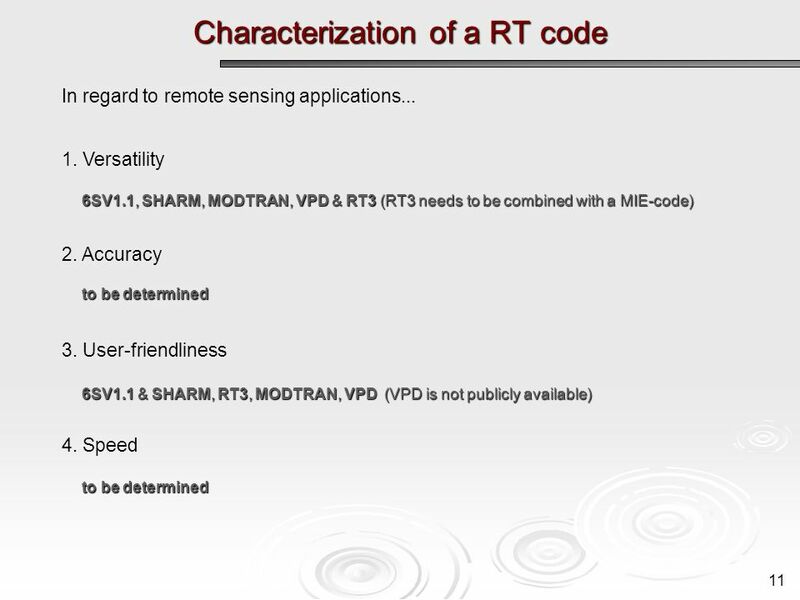 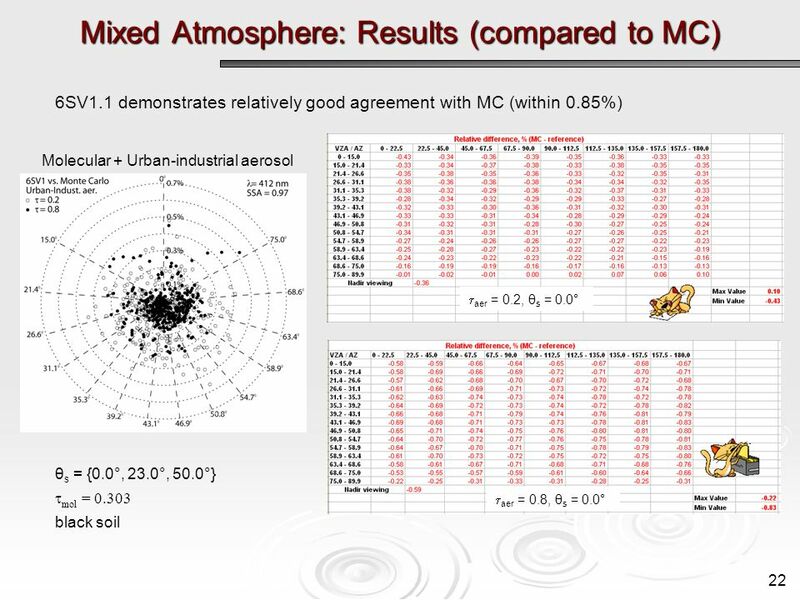 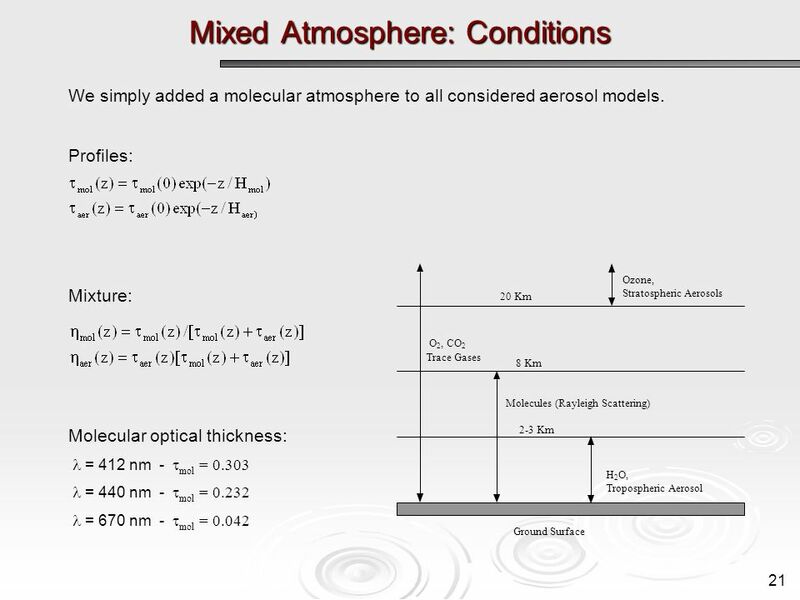 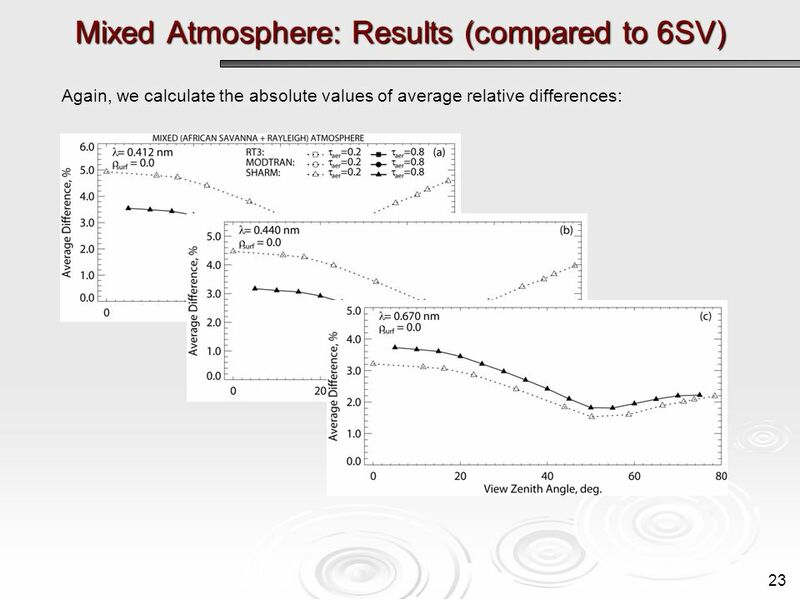 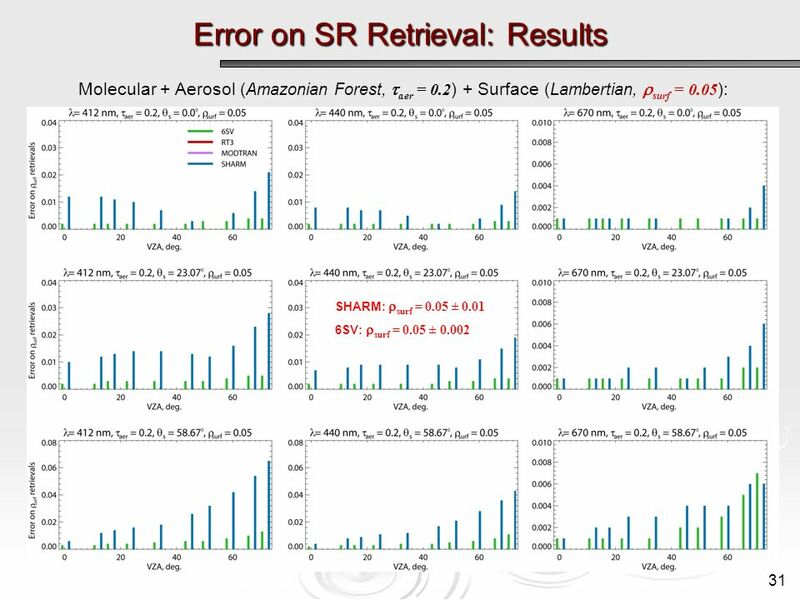 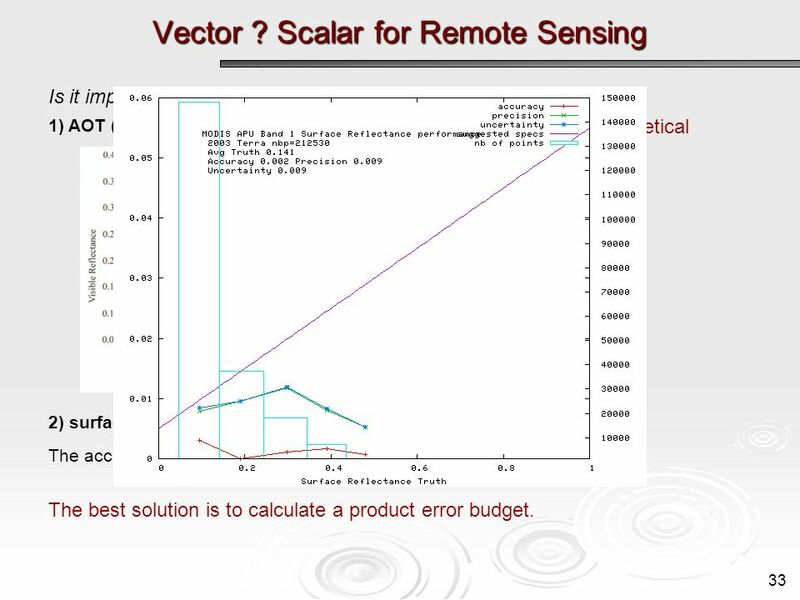 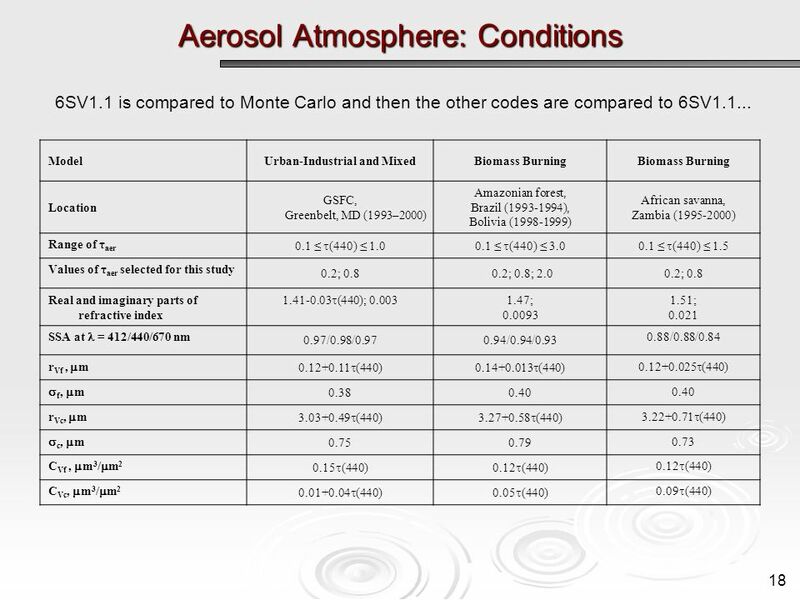 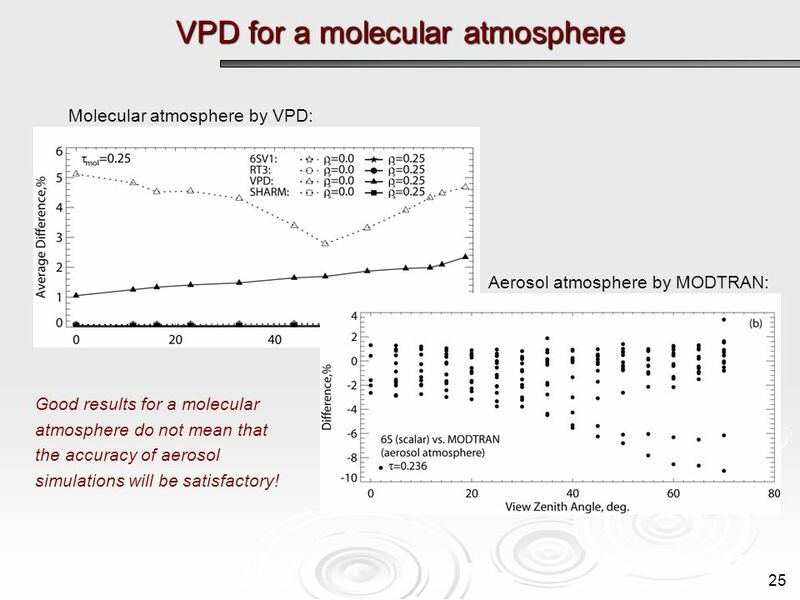 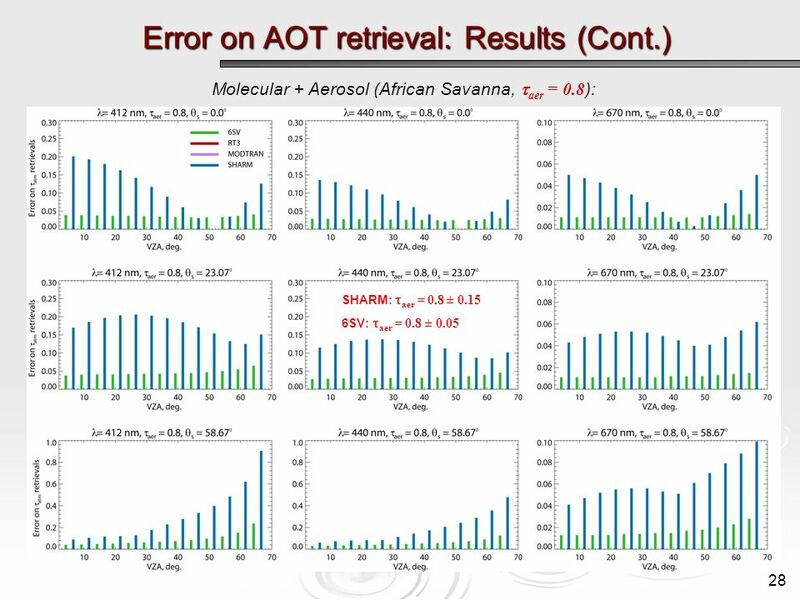 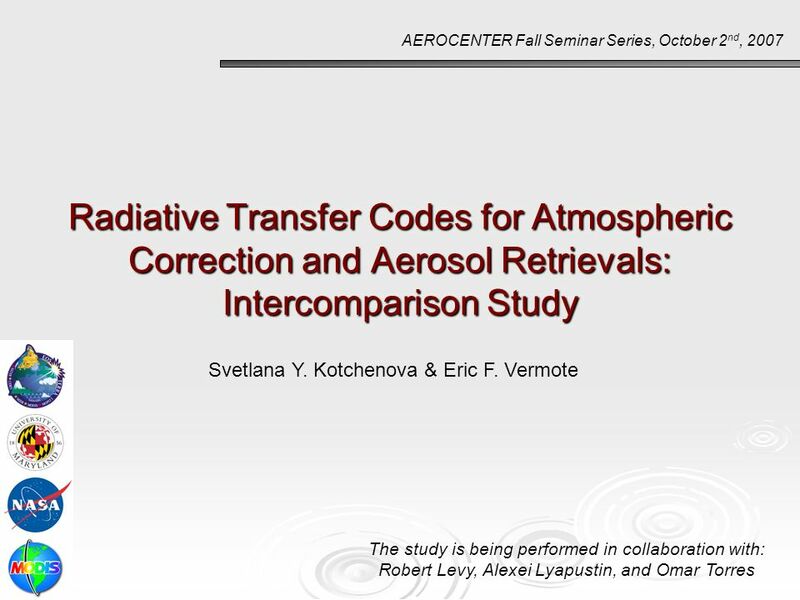 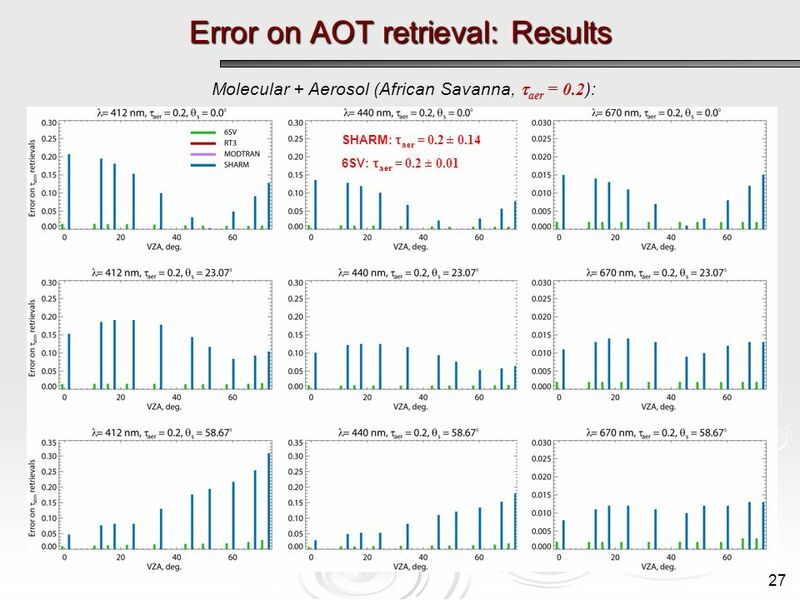 Download ppt "Radiative Transfer Codes for Atmospheric Correction and Aerosol Retrievals: Intercomparison Study AEROCENTER Fall Seminar Series, October 2 nd, 2007 Svetlana." 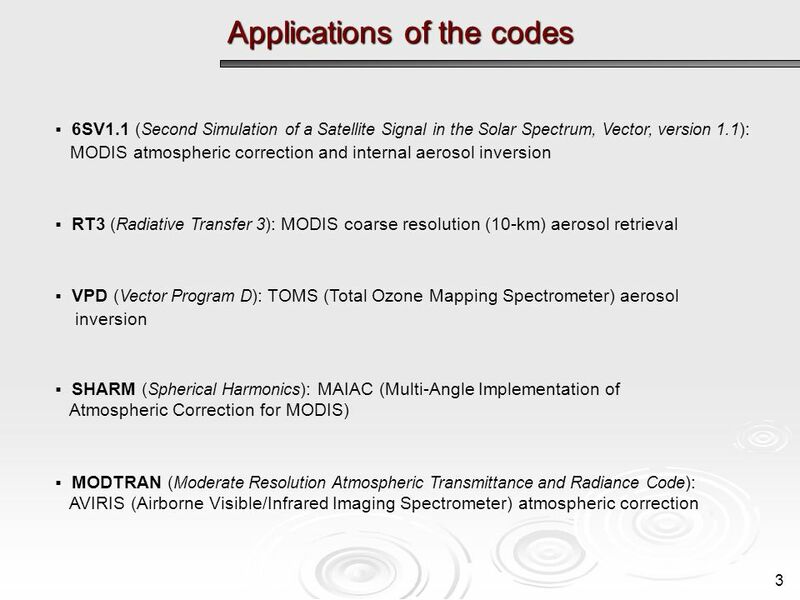 DEPARTMENT OF LAND INFORMATION – SATELLITE REMOTE SENSING SERVICES CRCSI AC Workshop November 2005 Remote Sensing in Near-Real Time of Atmospheric. 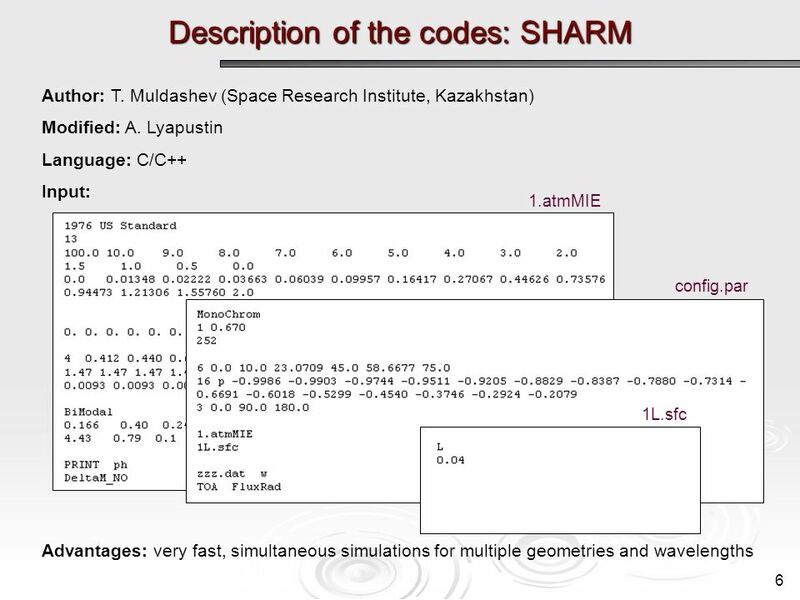 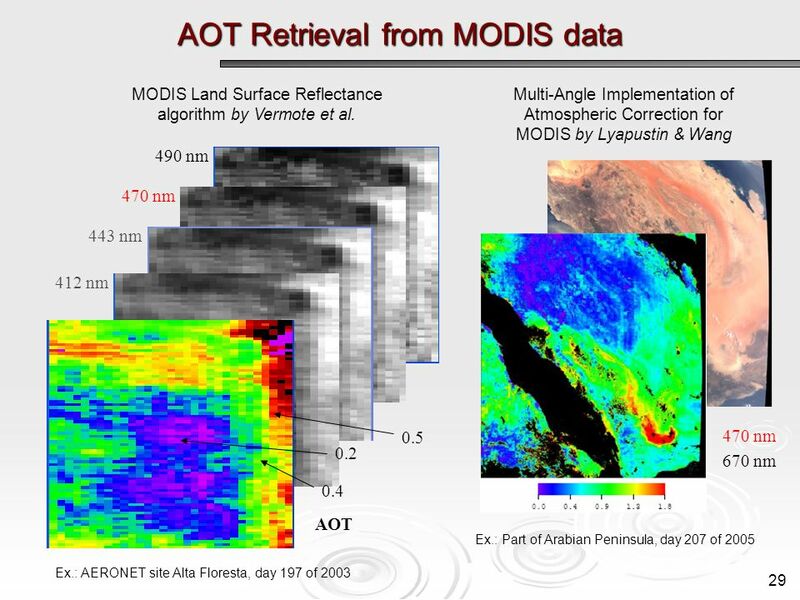 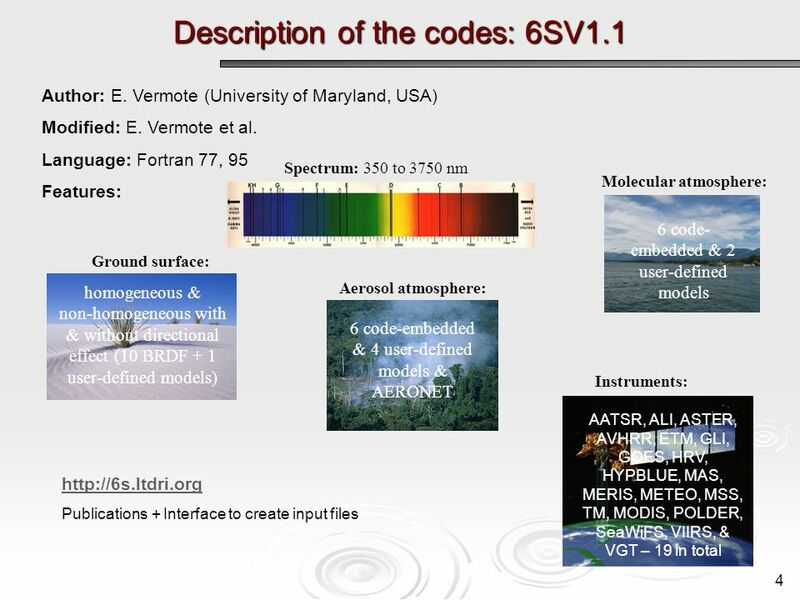 Validation of the 6S radiative transfer code for atmospheric correction of MODIS data MODIS ST Meeting, Land Discipline BreakoutMarch 24 th, 2005 Svetlana. 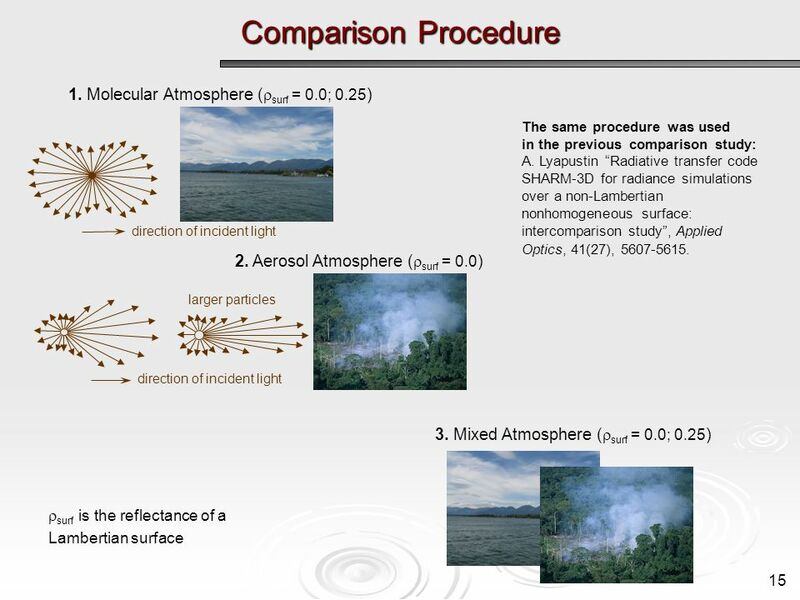 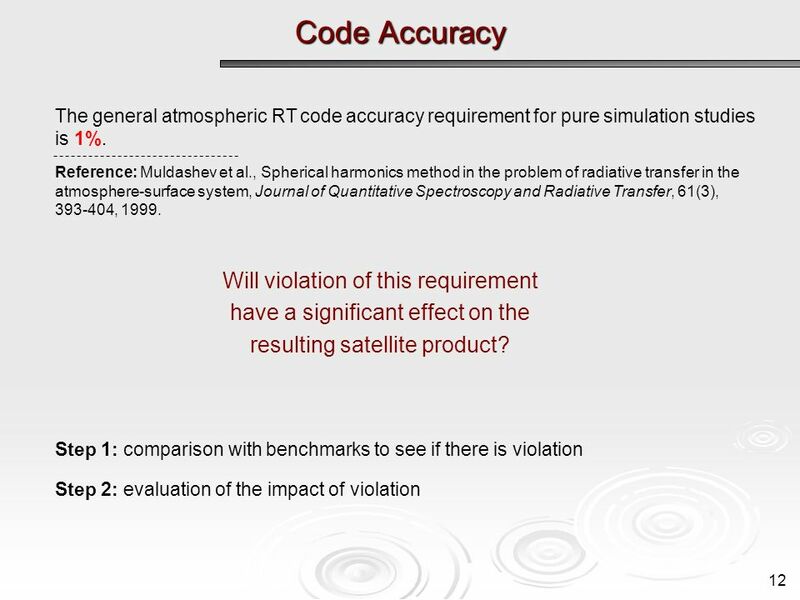 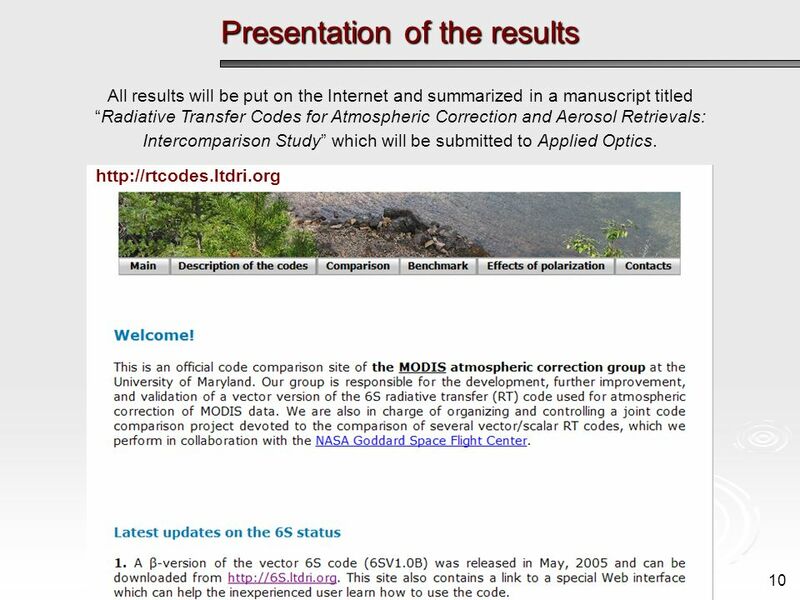 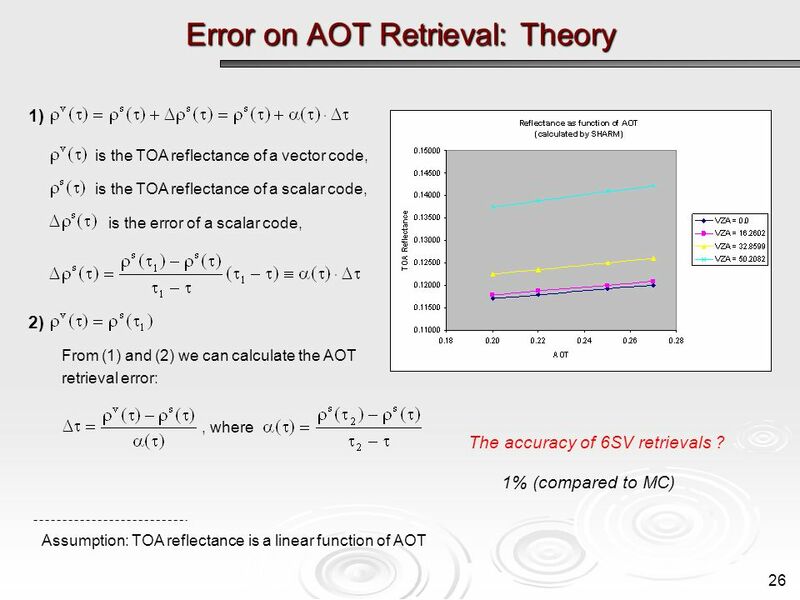 Validation of a new vector version of the 6S radiative transfer code for atmospheric correction of MODIS data AFRL Transmission MeetingJune 16 th, 2005. 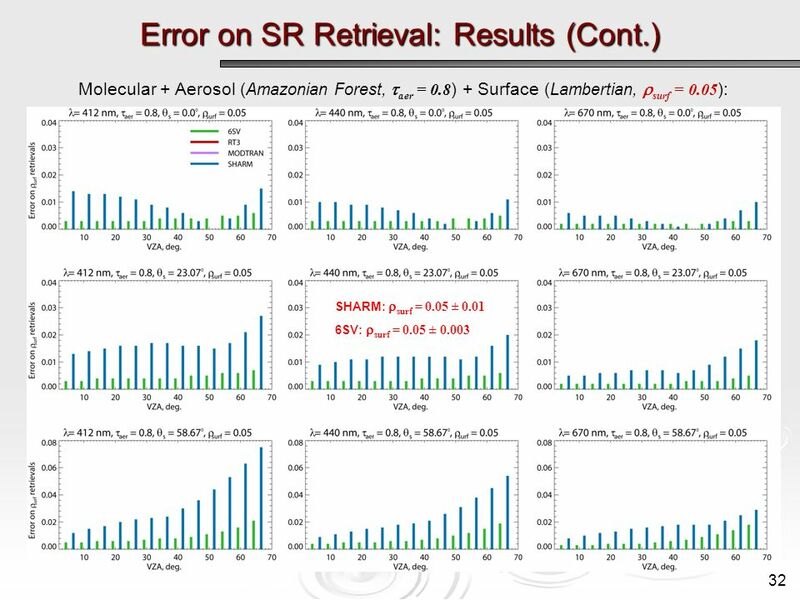 Seminar, May 16 th 2007, NASA GSFC Atmospheric Correction of MODIS Data in the Visible to Shortwave Infrared: Method, Error Estimates and Validation Eric.